On many of the sandy beaches, from the North Sea, along the coasts of the Atlantic Ocean and on the Mediterranean beaches, you’ll find the Sea Spurge Euphorbia paralias. And this plant has very interesting flowers! 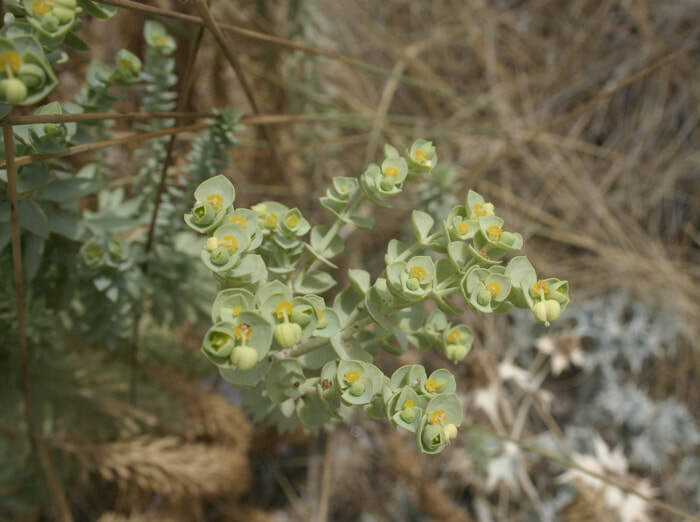 The Euphorbiaceae are a very large family and apart from Euphorbia you can meet several other genera of this family in Crete. Just to name a few : Chrozophora tinctoria, Mercurialis annua and Adrachne telephioides. Another well-known member is Ricinus communis (Castor Oil Plant or Cator bean) that is naturalized in many countries. Other members that you will not find so easily in Crete because they live in the tropics but which are famous members of this large family, are the Hevea rubber tree, Manihot esculenta (cassave) and the decorative Crotons. Furthermore many other beautiful cultivars, medicinally used and other useful plants. 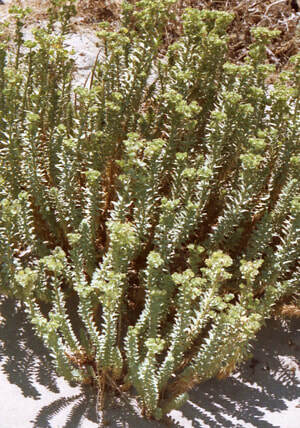 Before we go to Euphorbia paralias, let’s first take a brief look at the genus Euphorbia. Flora Europaea informs us that they have flowers without a perianth and that these flowers occur in small groups surrounded by an involucre. All Euphorbia’s usually exude a toxic milky juice called latex.Polunin adds that there are about 65 species of Euphorbia in The Balkans and Greece and that many of them are similar in general appearance and difficult to identify. Euphorbias have both male and female flowers within the same inflorescence. The male flowers are reduced to such extend that they consist of only one single stamen, jointed to the pedicel. The female flowers are solitary and consist of only the ovary on a long pedicel. The male flowers are numerous and they are encircling the female flower. The perianth is always absent. Flowers are standing in small groups and are, like a receptacle, surrounded by a lobed involucre with 4 – 5 horseshoe-shaped or semi-circular glands at the top, called a “cyathium”. Usually cyathia are surrounded by bracts and these ‘inflorescences’ of cyathia are mostly umbellate. The whole inflorescence is frequently encircled by a whorl of leaves. Now, let’s go to Euphorbia paralias. The male flowers exist of 1 stamen each and the perianth is absent. Look at the drawing please and notice (in “5”) that the stamens have a constriction somewhere in the middle of the filament, that is where the male flower (the anther) stands upon the pedicel. 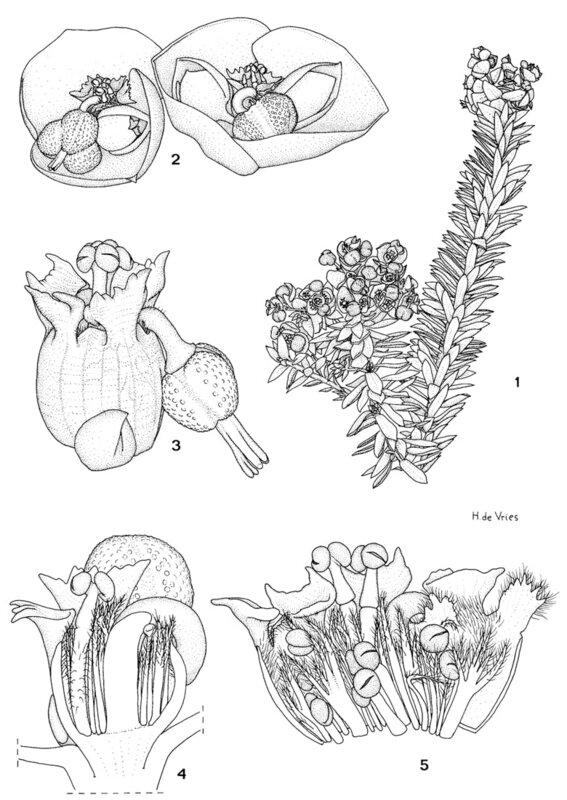 The female flower consists of a stalked 3-locular ovary, with 3 basally fused styles, and here too the perianth is absent (in the drawing in detail “2” you see two of these inflorescences). The female flowers are encircled by the many male flowers (because every “anther” is in reality a male flower and there are many of them, see drawing “4” which is a lengthwise section, and “5” is an opened flower). Each cyathium is solitary on a distinct peduncle. At the time of pollination both the ovary and its pedicel grow rapidly so that in one or two days the ovary, now pendant, is exserted beyond the edge of the whole involucre, see detail ”3”. There is one ovule in each loculus. The glands have two short ‘horns’ and are hairy on the inside. The glands seem to be quite active, always have a drop of a sticky fluid on it and mostly have a few small beetles and ants on them. The fruit is a capsule and is deeply grooved and granulate on the keels. The 3 seeds per capsule are large (approx. 3 mm) and rounded, smooth and grey. The seeds have a dormancy period and are able to float in sea water and remain viable for several years. A vigorous plant can produce 60 umbels in one season, with 25 to 40 fruits per umbel. This is not a problem in the Mediterranean region. In the Netherlands where it reaches its most northern border, it is a rare and threatened red-list plant. But recently it reached Australia and over there it is an alien invasive plant and a thread to coastal dunes because of their capability to rapidly invade open sandy habitat, their capability to form dense monospecific stands and to reduce the diversity of the dune habitat by replacing indeginous species. The Sea Spurge is widespread on sandy beaches and dunes. It flowers in May and June.